This winter, I was part of the Ecuador Team of Tufts International Development (TID) that travelled to Coaque, Ecuador, to check in on our ongoing digital library project, Koombook. TID is partnering with Libraries without Borders on Koombook, a device that allows its users to have access to hundreds of educational resources without the use of the internet. Last summer, TID placed two Koombooks in Coaque. 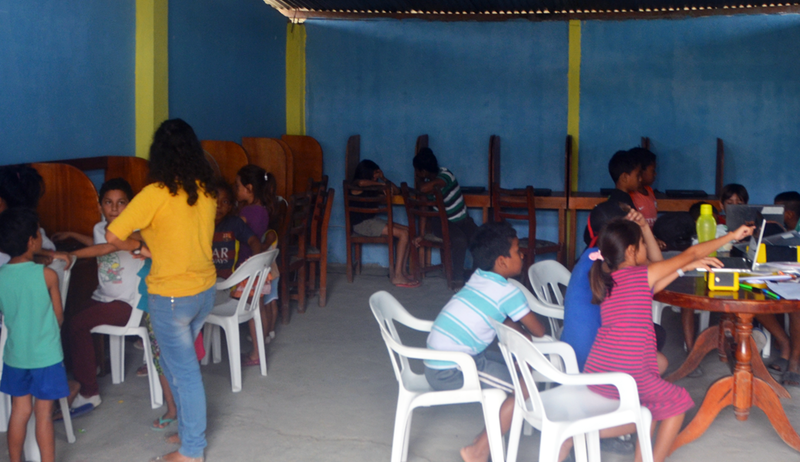 However, we realized that many children may not have been able to take full advantage of the resources. This was both due to administrative issues, the need to have the center consistently open and under supervision, and technological issues. To ensure that the centers are open consistently, we decided to hire a community member as a project facilitator. The Project Facilitator’s role is more than just administrative, in fact as a community member she will be a vital person in helping us move the project forward. Prior to embarking on this trip, we worked on criteria as a team for selecting the right individual to facilitate the program. We wanted a community member who was dedicated, cared for their community and was passionate about the project. On our first day in Coaque, we interviewed several candidates, and after consideration we hired Virginia. She will help run computer literacy workshops, conduct homework sessions for the kids and most importantly ensure that the project is sustainable. During our trip, we also encountered technical problems with our Koombooks, neither was working correctly and much of the information was inaccessible. Joaquin and I decided to return with the devices to Quito, where we could connect them to reliable internet and get help from the software developers in Paris. Juan David Nunez, the Tufts alumnus who began this project two years ago, will return to Coaque with the devices on January 20 and reopen both centers. Our ultimate goal is for the project to be fully community-run, and having a facilitator like Virginia within Coaque is key to making that a success. She will ensure that the centers are open daily, and recruit volunteers to help her maintain a consistent schedule. In the long-run, once the program gathers enough volunteers and support from the community, we hope that they will be able to manage it without our help.